Mark's Daily Apple Are Potatoes Healthy? Last week, I made the case that potatoes  aren’t nearly as bad as some people make them out to be. They’re carby, sure, but lean, active people who can tolerate carbs are way better off eating potatoes than grains , and even for low-carbers, a potato makes for a good, gluten -free cheat meal. Their place in your diet depends on the metabolic context. In my so-called “final word,” I said there isn’t one, at least not ordained from above. You have to figure out for yourself whether or not they fit into your diet. You might even say you have to go with your gut on this one (in more ways than one, as you’ll see). That’s actually pretty decent. It’s certainly more interesting than rice . It contains very little phytate, so the minerals will be plenty absorbable. The carbs are almost all starch, meaning they’re perfect for replenishing glycogen  stores after a workout. It’s a solid tuber, and a better, more nutritious starch source than are grains. The glycoalkaloids  most prevalent in potatoes are alpha-solanine and alpha-chocanine, which the plants use to repel pests. Most of the glycoalkaloids are luckily concentrated in the skin of the potato, forcing less refined pests to eat through the toxic stuff to get to the good stuff. We have the luxury of employing peelers (pinky in the air, no doubt) to avoid most of the glycoalkaloids (which are not reduced through cooking; you have to physically remove them). This is probably why traditional potato-eating cultures peel the potatoes they eat, unless you count the urbanized Quechua migrant eating cheesy tater skins at the Chili’s in Lima. And, as commenter Anand points out  in Don’s excellent post, our ancestors would have definitely removed the charred skins after roasting tubers directly in the hot coals. 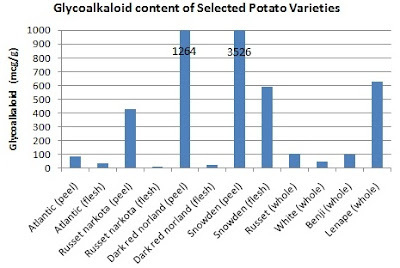 These days, the most common potatoes, like Russets, also tend to have the lowest amount of glycoalkaloids (see Stephan’s chart ); this is no accident, instead being the product of generations of careful agricultural selection by farmers. Throughout history, then, humans have tended to avoid the bulk of potato glycoalkaloids, either unwittingly, by peeling potato skins, or by selecting the low-glycoalkaloid varieties that didn’t provoke stomachaches, digestive issues, or inflammation and sold well at the market. But glycoalkaloids remain. Are they harmful? Certainly, but the devil lies in the details. High dose glycoalkaloids are clearly harmful, but most peeled normal potatoes do not contain high doses of glycoalkaloids (again, I refer to Stephan’s chart). Most studies showing harm used supra-physiological doses of pure glycoalkaloids; one of the only studies to show harm  using physiological doses that you’d normally get from eating potatoes used intestinally permeable rats with a genetic proclivity toward inflammatory bowel disease. This is a useful study, though, because it tells us that potatoes might be a danger for humans with leaky guts or existing inflammatory bowel disease. I’m sure you know someone in that position. It may even be you, or a loved one. How common is leaky gut? It’s difficult to know for certain, but I think looking at how many people still eat wheat , grains , sugar , and vegetable oil  as a significant portion of their diet can give us a pretty good idea. The Paleo Diet newsletter on nightshades pointed out a couple studies showing increased inflammation markers upon potato feeding, but one altered multiple dietary factors simultaneously  (not just potatoes) and the other used potato chips . Was it the rancid seed oil the chips were fried in, or the potatoes? Was it the wheat bread or the potatoes? These tell us very little about the effects of whole, untarnished potatoes on inflammation. I can also see potato glycoalkaloids being problematic in the context of the inflammatory standard American diet (rich in gluten, omega 6 , and sugar). This is similar to the persuasive argument that casein  is only problematic once gluten has perforated the gut lining and allowed entry. Do potatoes pose an issue for people with intact guts? As it stands now, there is very little published evidence that potato gycoalkaloids cause problems in metabolically health individuals without compromised guts, but there are anecdotal accounts. If you feel up to it, head out to the store and try some potatoes. The basic Russets are good, but dozens of varieties exist. Grocery stores should carry Yukon golds, red potatoes, fingerlings, and maybe a couple boutique varieties, but the real interesting ones are found at farmers’ markets. At the local Santa Monica market, there’s a whole stand devoted to potatoes of all kinds. They’ve probably got a dozen varieties, and it’s always changing. Purple potatoes, half yellow/half purple potatoes called Laker potatoes (hey, it is LA), tiny little red ones the size of gumballs, multicolored gnarled ones that look like an old crone’s rheumatic claw – these guys are committed to their tuberous artistry. Even for someone who doesn’t eat a ton of potatoes (I, honestly, don’t train hard enough anymore to require a lot of glycogen repletion ), I find myself generally picking a handful or two up when I’m there. I’m rarely disappointed. Always store your potatoes in a cool, dark area. Avoid light exposure, which can turn them green and increase the glycoalkaloid density. Cut off any sprouts or stems; better yet, just toss ‘em altogether if they sprout. You don’t want to take the risk, and they’re cheap enough to sacrifice. For heavy lifters and highly active exercisers who want to incorporate potatoes, it makes sense to bake a bunch at once and store them in the fridge for easy post-workout consumption. They’ll stay good in the fridge for about a week and a half. For PBers interested in trying a carb refeed , potatoes are a great choice. Stephan’s Potatoes and Human Health series, in which he goes into more detail on the glycoalkaloid concerns (short version: very little evidence that normal levels of potato glycoalkaloids poise a problem for healthy humans) and discusses several traditional cultures that fared well on high-potato diets: Parts 1 , 2 , 3 . It is impossible to argue with your own personal anecdotal evidence . Anecdotes won’t stand up to peer review, but I find it difficult (and unwise) to discount a barrage of them. If you’re overweight, avoid potatoes for the carb count  and because you’re probably still fairly inflamed, and potatoes might aggravate your condition. If you’re sensitive to nightshades  (tomatoes , peppers , eggplant  are the common ones) and have experienced negative effects from consuming them in the past, be wary of potatoes. Potatoes are also nightshades. If you have a known autoimmune disease, a leaky gut, or are especially sensitive to dairy , grains, eggs , or nuts , avoid potatoes until it clears up. If you need an affordable source of whole food  calories, consider potatoes. If you’re stalling on weight loss as you near your goal, try carb refeeds  with potatoes to restore leptin  and jumpstart the leaning out process.